Many of us are lucky enough to spend Christmas and all year round under a roof with our families and loved ones. On the other hand, those at Mission Australia’s Charles Chambers Court are not so lucky. The residents of Charles Chambers Court consist of men and women who have no home and no family to turn to. Many of them are elderly and without the proper living conditions are unable to look after themselves. Luckily, thanks to the kindness of Mission Australia, their Aged Care Facility in Charles Chambers Court is now keeping many people off the streets and in a safer home. They are provided with a warm bed, plenty of meals and a dedicated team of staff to provide the residents with proper care. 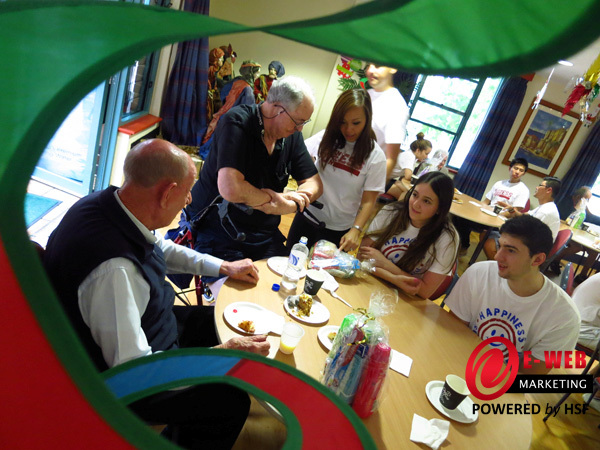 On the 15th of December 2012, E-Webbers spent their second Christmas morning tea at Charles Chambers Court to spread the holiday cheer. We arrived at Charles Chambers Court nice and early to serve pastries, cakes and morning tea essentials then spent quality time getting to know the residents and sharing a few jokes and stories. Many of the residents had so many life stories, fun memories as well as photographs to share. It brought a smile on their faces knowing that they had people there just to share some tea and talk to and it brought a smile to my face to see every E-Webber sharing so much fun and laughter with the residents. After some remarkable chats and photographs that we can cherish for a lifetime, we decided to give back to the less fortunate residents by providing them each with a care package for Christmas containing all the bare essentials they’ll need for their day-to-day. It was heart-warming to see so many faces light up and I’m so grateful that Mission Australia has provided these wonderful souls with a roof over their head and someone to look after them. If you haven’t heard of Mission Australia before, they run many programs across Australia to help those who are unable to do so themselves. 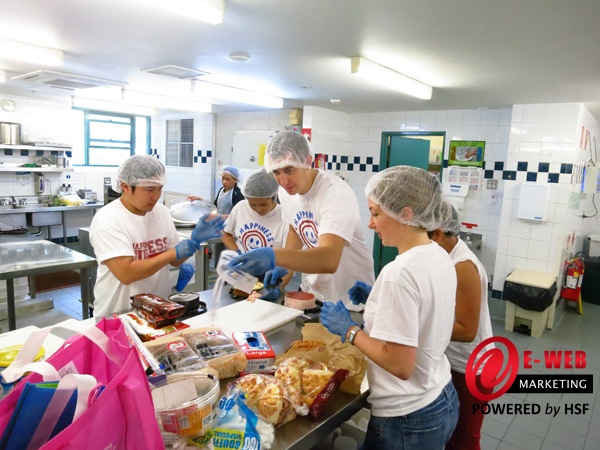 Giving back is the most rewarding feeling and there are many things you can do to help the less fortunate get back on their feet. 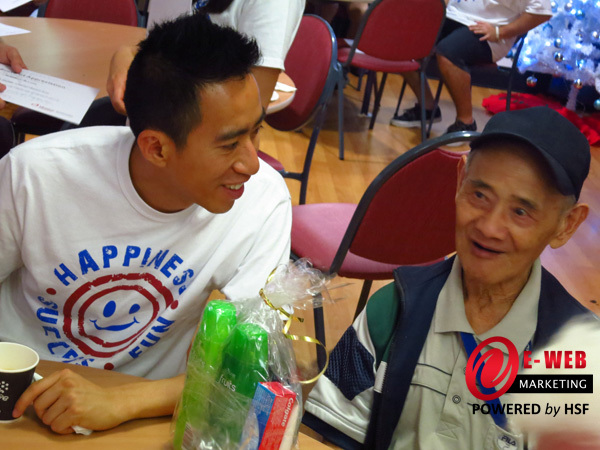 After Morning Tea at Charles Chambers Court, E-Web’s day of ‘Giving Back’ didn’t stop there! 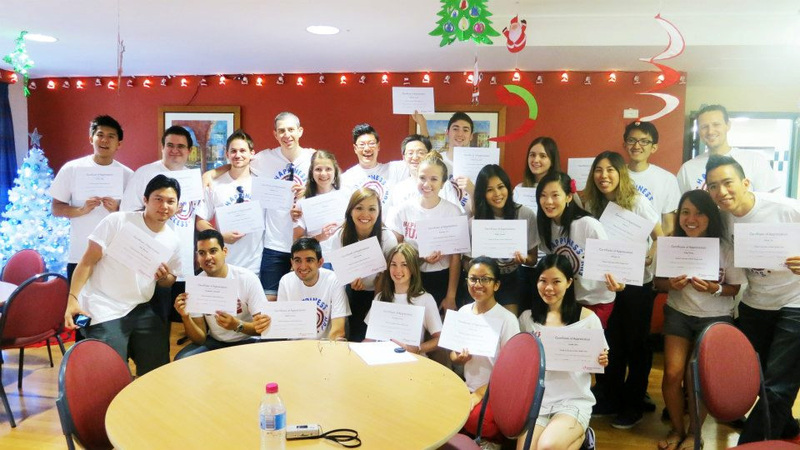 To add a little fun and games we split into teams of 4-5 people and each team was given $100 to use to spread as much Happiness, Success and Fun as possible to the Sydney Streets. The purpose of the exercise is two folds. To challenge our ability to reach the maximum amount of people with limited resources. 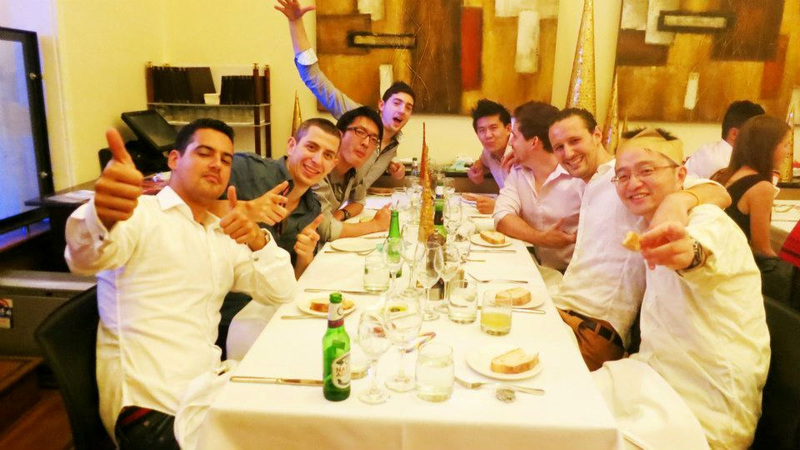 Each team had to record or capture what they did with their $100 and by the end of the day the footage was condensed into a video to be played at the E-Webber’s Christmas Party that night at the Hyde Park Barracks Cafe. It was so great to see everybody arrive at Hyde Park Barracks Cafe still so full of energy despite a full day at Charles Chambers Court and running around the City. After we all shared a few drinks and laughs, as a token of my appreciation I got on the microphone and thanked the E-Web Family as well as each E-Web Member individually. There were a lot of new faces in the family at this year’s Christmas Party but we’ve had such a tremendous year together that I had so much gratitude to express to each and every one of them. The contribution that we have made to society this morning as well as the constant care and dedication the E-Web Family has shown to their clients and to each other, is very heartwarming to witness. Following my speech was the video montage of how each team spent their $100 budget to spread Happiness, Success and Fun. My team went around the City and gave away hundreds of colourful balloons to strangers for free, another team dressed up as Santa Claus and his elves and gave away candy canes – they instantly became an attraction for kids, families and tourists alike. The winning team that ended up getting the most votes for spreading the most Happiness, Success and Fun came up with the clever idea of putting together bundles of gifts and leaving them inside a mysterious large box with the sign “Free Gifts!”. When watching the video footage, at the beginning the passers-by were very skeptical and were hesitant to reach inside the box but once the Happiness started to spread, the laughter and fun quickly ensued. Seeing frowns turning upside down was definitely one of the highlights of our day! For the remainder of the night we spent it on the dancefloor with our fantastic DJ. It was a really great way to end the year and we are all so excited for 2013!